Mobile Ad Blocking: Publisher’s New Nightmare? I am studying the MA New Media and Digital Culture at the University of Amsterdam. Online adverti sements are a great source of income for both web publishers and advertisers. These advertisements can be found in multiple ways, such as banners, pop-ups, news feed ads (sponsored stories) and trick banners. Banners and news feed ads are relatively ‘innocent’, by which I mean they are not interrupting the user’s web browsing. On the other hand there are pop-ups and trick banners which often result in miss-clicks and diverting the user to other webpages, in some cases even viruses. For the last two years there is a visible trend in blocking these (unwanted) ads. Google Trends displays a graph showing the rising interest in ad block software. The exact number of users is unknown, but according to PageFair and Adobe over 144 million people uses ad block software (Butcher). This has caused a shift in advertising solutions. An eMarketer report from April this year (on the right) shows that desktop ad spending currently leads by a ‘mere’ billion, but in two years’ time mobile ad spending will double the desktop’s spend. In my opinion this trend is already showing to be true, because in my mobile web browsing experience I often encounter ‘aggressive’ advertisements on mobile devices, like pop-ups and in-app ads, that interrupt the user’s activities. This is the reason I am writing about a new piece of mobile software that might turn everything around again: the Adblock Browser. This editor wrote his article because at that moment the news came in that European mobile networks are planning to offer ad blocking as a service to their customers. On the other hand a Techcrunch editor writes that what has to happen “is that publishers […] need to start reigning this insanity back”, by which he means that publishers turn a blind eye to page load times, battery life and data cost of these mobile ads.It is interesting to find these different opinions on the ad block debate. Between all the heavy arguments Adblock Plus simply states that they just want to improve the users’ mobile experience, but by doing this they are only adding fuel to the fire that is the ad blocking war. And now for the first time this fire is spreading to the mobile platform, because the Adblock Browser is the first app that, according to the tech-site reviews, does what it says. There are other parties with a big say in this war, namely Apple for iOS devices and Google for the Android version of the browser. Both parties have accepted the app into their app store, but previously Google had denied access to the Adblock Plus extension (for existing browsers) due to “interfering with another service or product in an unauthorize d manner.” This move was widely questioned because Google has been all about non-intrusive ads, about which has been written on Techdirt. Until this date the extension app still hasn’t returned to the Google Play Store, even though the Adblock Browser is now accepted. Of course, being accepted isn’t the same as being promoted, it takes at least a few taps before I can even find the app: when I enter the query ‘adblock’ in the Google Play Store the results show me two apps and two books (see on the right). Then I have to tap ‘more’ to find the Adblock Browser on the sixth place (ironically none of the five results above show the word ‘adblock’ in their title). The question remains if this browser is going to be a real thread to mobile advertisers. Will people really switch to a new browser, which is a more radical solution than a browser extension, and will it get as mainstream as desktop ad blocking? Because if so, this war only just started. Bryant, Martin. “Adblockers Are Immoral.” The Next Web. N.p., n.d. Web. 13 Sept. 2015. Butcher, Mike. “Begun, The Mobile Ad-Blocking Wars Have.” TechCrunch. N.p., 8 Sept. Web. 13 Sept. 2015. Google Trends. 13 Sept. Web. 13 Sept. 2015. Hof, Robert. “Mobile Ad Revenues Will Blow Past Desktop Ad Spending By Early Next Year.” Forbes. N.p., 25 Mar. Web. 13 Sept. 2015. Lomas, Natasha. 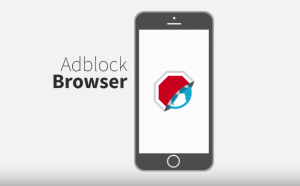 “Adblock Plus Finally Lands On iOS And In Google Play — As A Browser App.” TechCrunch. N.p., n.d. Web. 13 Sept. 2015. Masnick, Mike. “Bad Move: Google Removes AdBlock Plus From Google Play Store | Techdirt.” Techdirt. N.p., 15 Mar. Web. 13 Sept. 2015. Vincent, James. “Adblock Plus Releases Its Web Browser for iOS.” The Verge. N.p., 8 Sept. Web. 13 Sept. 2015. Williams, Owen. 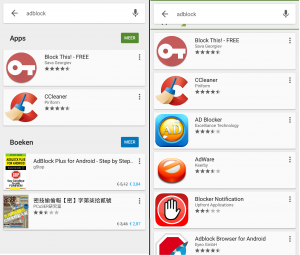 “Adblock Plus Officially Lands on Android and iOS Today.” The Next Web. N.p., 9 Sept. Web. 13 Sept. 2015. FireChat: a breakthrough in mobile ad-hoc/mesh networking?